This is partly working (read on) implementation of App-config workflow using SCM. Here is detail a ‘config app’ that uses Git and Angular. GitHub’s used too, but for your production, staging, etc config details you’ll not want to have that in a public repo. I’ll also ignore the ‘all or nothing’ permissions issue for Git branches (mention in the last blog entry). Fork the GitHub repo - https://github.com/paul-hammant/app-config-app, then clone it to your fine system. AngularJS figures on the client side. 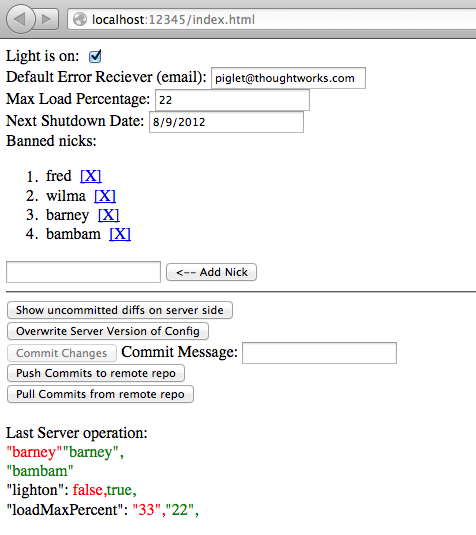 It handles the interop with the back-end(s): diff, commit, push, pull. It also has the nature of the configuration document encoded within it. That could have been abstracted out, but I’m wondering if that ‘spec’ is not better left within the declarative grammar of Angular. As mentioned in the previous blog entry, on different branches, you’d have different stack configurations. In the index.html file, its fine to hard code the environment name. You would maintain divergence of that via ‘strategy-ours’ merge feature of git. Multiple users to one config app instance will trample on each other’s changes. 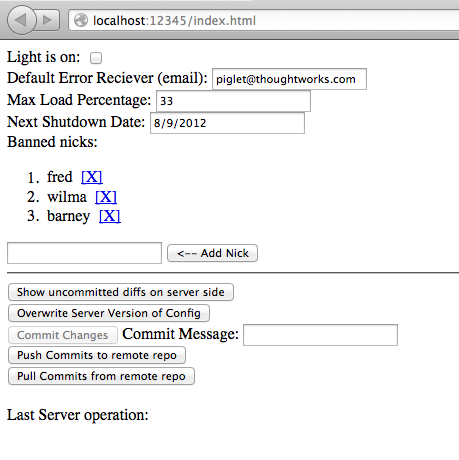 I would want to get Jenkins (or your CI tool) to re-launch the Ruby script whenever it changes. Being all-in-one lends itself to that. In the web-app, there is no notion of a logged in user. As such, all changes will be tied to the person who cloned the original repo. As bad, all your stack’s config is available to guests to that URL. You might not want to have all employees seeing all production config. Protection against cross site scripting: Any post of JSON content back from anywhere will be accepted. Even though you would not deploy this publicly, you still should move to JSONP for post backs. If we were to turn this into a robust app, use of Git would have to be via APIs. The same would be true for alternate apps SCM back-ends like Subversion, Perforce or TFS. Command line invocation to a shared working directory is not going to really work.